Women Road Trip Outfits – Road trips are the perfect way to take a break and relax after you have been exhausted with work or college. Whether you are going with your friends, family or your special one you can already imagine yourself having a blast with the windows down, cool breeze in your face and your favorite music in background. While all of this a hell lot of fun, you need to remember that it’ll be hours until you reach you stop somewhere and being stuck in a car for that long can be a pain if you are not properly prepared for it. Apart from all the packing, choosing your outfit for the day is a very important job. You would want to stay casual and not overdressed, but look stylish at the same time. Keep in mind that travelling can be tiring and that’s why you need to wear something you are extremely comfortable in. Go for comfortable clothing items such as leggings, tees and tanks. Do not even think about wearing heels! Flip flops, flats and sneakers are preferable. Carry a tote bag or a large handbag to keep your essentials handy. Do not forget your sunglasses and cap/hat for times when the sun roof is down. Keep your makeup and jewelry minimal and hair tied to stay comfortable. For more ideas, check out our list of top 20 outfits to wear for a road trip that is surely going to help you pick your outfit for the day. This outfit is perfect for sunny summer days when you just want to stay easy and cool. You can pair a cute tank top with denim jeans or colored pants. Here are 16 Cute Outfits with Tank tops. On chilly days you can simply wear your favorite sweater or hoodie. Skinny jeans can be a bit annoying especially in summer. So the best thing you can wear on such days is leggings. Black leggings go with almost every top and color. Do check out these 21 Ways to Wear Black Leggings. Hop on to the denim on denim bandwagon to look trendy and cool. These dresses are super comfortable and not just that they also look very stylish. You can wear one in a floral or some other cute print. You can also find inspiration from these 20 Ways to Dress Like a French Girl. Rompers are very comfortable and will make you look trendy and unique. 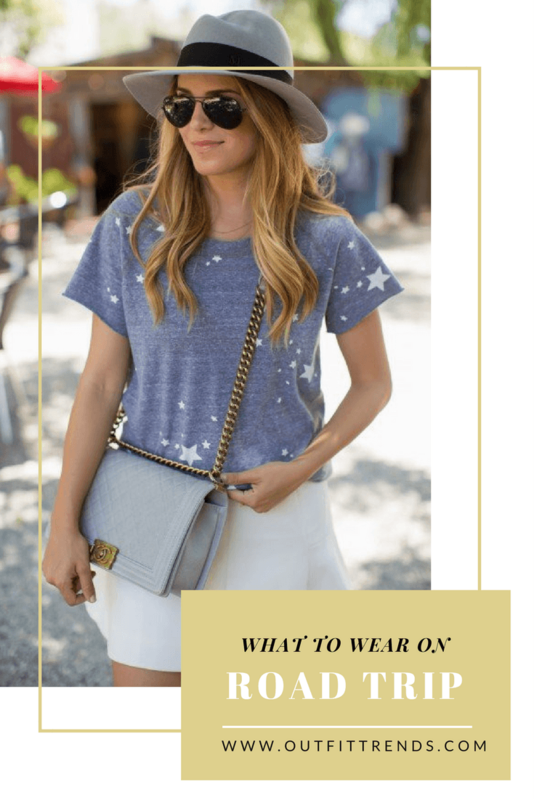 You can carry a matching handbag to keep your essentials and a cool hat that goes with the look. Wearing skinny jeans and fitted pants can get uncomfortable if you have to sit in that car with limited space for hours. Go for something loose such as bell bottoms to avoid discomfort. Here are 20 Best Pinroll Jeans Outfits for Women. Some of the absolute must haves for road trip include comfortable outfit such as a cute t shirt and footwear for starters. You should carry a bag for some basic makeup, sunscreen, sunglasses, moisturizer, deodorant, water and snacks, camera and emergency kit. Since heels are a big no, you could wear pumps, ballet flats, sandals, flip flops or sneakers. Here are 27 Sockless Tips for Women. Just the simple addition of a scarf can make you outfit look much better. You can let it loose in your neck or tie it in cute styles. Let’s admit it, everyone loves wearing sweatpants. Wear it with a matching shirt for a casual and chic look. Do check out these 20 Shoes Women Can Wear With Sweatpant. Because everyone has tonnes of striped and checkered shirts lying around, now is the time to wear it! If you want to look unique, you can go for a trendy top with white pants. You will need to do a lot of layering in winters and here is one such look. Wear a sweater over a denim shirt for an elegant look. Here are 13 Cute Minimalist Outfits for Winters, that are great for road trips. You can experiment with bright color combinations as they look super adorable. Shorts and skirts are great for hot days. You can pair them with a t shirt, tank top or your favorite top. Check out these Stylish Wrap Skirt Outfits. Who says you can not wear a jumpsuit for a road trip? Unless it is not a very fancy one, you can totally pull it off in style. Handling your hair can be a big hassle on humid and hot days. If you want to stay care free and just enjoy then go for a pony tail hairstyle or bun. Always remember that comfort comes first, there is no point of wearing something that looks good but is out of your comfort zone. If you keep all these ideas and tips in mind, we guarantee that you will have the best trip of your life. We hope you liked this article. Do not forget to give us your feedback in the comments! Great outfit ideas for the road. It is so important to dress right, especially for a long trip. Love your suggestions.